The Kugti Pass in the Chamba district brings the scenic crossroads at an altitude of around 5,050 m above the sea level. Being the part of the Pir Panjal range of the Central Himalayas, this could be a perfect destination for the trekkers. By ascending to this region, the trekkers can reach up to the Duggi plain which is a grazing land and an ideal camping ground. While reaching at the summit, the trekkers can get the chance to find the spectacular Mani Mahesh Kailash Peak, the Dhauladhar ranges and also the snow capped mountains beyond Lahaul Valley. At the base of the Kugti Pass, the trekkers can also explore the Leah Cave. The Kugti Pass and Lahaul Valley trekking trail starts at Brahmaur that leads to Hadsar, which is 13 km away, and from Hadsar the ascending and descending trail takes the trekkers to reach Kugti village. At Duggi Plain, the travelers pass through the village, and cross a side-stream to further climb along the Budhil Gorge. On the trekking route, the presence of Keylong Temple and the temple of goddess Murkula Devi of Kugti Pass make the spot more rejuvenating and spiritual. From the temple, the tourists can climb through alpine meadows to reach Duggi camping ground. This vast rocky grassland is located at the confluence of the Budhil River and Duggi stream. Upon arrival at Delhi airport transfer to hotel for overnight stay. In the morning half day city sight seeing tour and afternoon transfer to New Delhi Rly. Station to board Shalimar express train at 15:55 hrs. Dinner in pantry car. Early morning arrive at Mcleodganj by 03:30 hrs. Enroute wash & change followed by breakfast, afternoon time at leisure to relax, evening a brief on the entire program and distribution of equipments, dinner & overnight in hotel. Early breakfast - your trek begins towards Truind passing through Dhramkot. The trail to Truind is generally gentle except last few kms. Dinner & overnight in tents. Post breakfast - his day the trail follows the ridge behind the prayer flags above the. The trail climbs generally through oak and conifer forest and across the open meadows to the encampment at Laka Got. The last 200 - 300 mts is tiring to Lahesh Cave. Dinner and overnight in tents. Start trek with packed lunch, the trail follows the true left of the valley for the first few kms. Later the trek crosses the valley on a permanent snow bridge and ascends steeply to an open meadow. Continue down the true right of the valley and after crossing a series of meadows finally descends to Kurasi. Dinner & overnight in tents. The trek goes through thick forests and lush green fields. You come across many small places inhabited by Gaddi people. Dinner & overnight stay in camp. In the morning trek to Garola. The trail goes by the side of river Ravi. Dinner and overnight stay in tents. In the morning after breakfast trek to Brahmour. Its a beautiful village and is well connected to Chamba by roads. Stay in guest house is preferred. A narrow road leads you to Hadsar from Bharmaur, which is dangerous for cars and jeeps. It is advisable to go on foot. Hadsar is a small village with tea shops and few people living nearby. From Hadsar, one trail goes to famous Manimahesh Lake and other to Kugti village. Little down from Hadsar, there is a camping place in the forests. Kugti is 13 kms from Hardsar. The trail is narrow. You should cross the narrow trail one by one. You also have to cross small wooden bridges over streams. Sometimes, the Buddal River becomes turbulent and causes devastation. The Kugti village is inhabited by approximately 1000 people. Kugti village has shops and a Civil Dispensary. The people of the village belong to Gaddi tribal and are very helpful. The Kelang temple is nearly 5 kms from Kugti village at the height of 3,200 meters. The temple is dedicated to the Bazir of Lord Shiva. 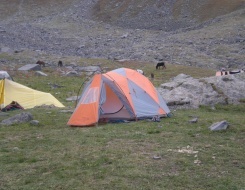 Close to the temple is a place for night camping. It is 6 hours walk from Kelang temple to Duggi through green pasture. The place is very close to the mountains from all sides so you should have some heavy clothes to face the chilly winds of the Pir Panjal range. Lehs Cave is situated at the bottom of Kugti pass. Sometimes it snows in the month of July here because of high altitude. Lahesh is surrounded by Pir Panjal and Manimahesh Dhar. The excitement and adventure reach to the peak when you cross Kugti pass. You should start early in the morning so thatyou can reach the pass before the sunrise. It takes about 4 hours to reach the pass. It is a steep climb up to the pass. Beyond the pass is a big glacier with some hidden and some open craves. You need good equipment and a trained guide to walk over this glacier. After 6 to 7 hours walk, you reach at the camping place called Khurlu. Remember that only an expert guide can locate the trail to Khurlu. After 10 kms. walk from Khurlu, you reach the first village of Lahaul Valley. The trek involves a number of ridges crossing and glacier walking. The trail is not easy to locate because of rocky path and glacial moraine. Finally after crossing a small glacier, you reach Rapa Village for night stay. Keylong is 22 kms from Rapa village. After 3 hours walk, you reach the road head at Sansa. From Sansa it takes another 3 hours to reach Keylong by bus. Keylong is the districts headquarter of Lahaul and Spiti. There are some good hotels at Keylong. From Keylong, you can go to Leh or come back to Manali over Rohtang Pass. In the morning after breakfast drive to Manali via Rohtang pass. On arrival transfer to hotel for relax. Dinner & overnight stay. Today we will do half day sight seeing at Manali and in the evening drive to Delhi by AC Volvo coach. Overnight journey.